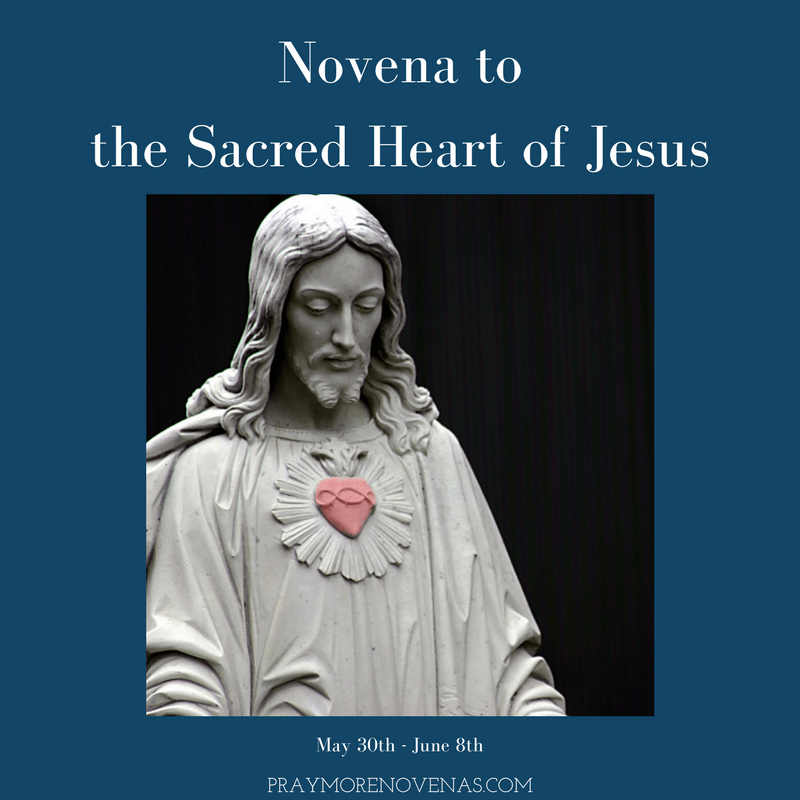 Here’s Day 2 of The Sacred Heart of Jesus Novena! Good night, I prayed the Novena prayer for the entire duration and God has answered my prayers and provided me with a job. Thank you almighty God, blessed Jesus and you pray warriors. I feel truly blessed. Lord Jesus I pray for your healing touch upon my husband Jeffrey that he will be healed from colon cancer and you will stop the metastases on his liver and lymph nodes.I ask this in name of Jesus our Lord and Saviour. Oh Jesus I thank you making this job call me. Friday was the interview it was great they ask me if I wanted nights which I said yes I did all my references. Still waiting to hear from the job oh sacred heart of Jesus you said who shall ask should receive who seek shall find who shall knock shall be open I just ask you to continue to pray for me that they will call me back for a job Amen ? Thank you dear Lord for hearing what is in my heart and soul & my angst and fears. With your grace I will follow you and allow you to lead me wherever it is that you want me. Faith, hope and grace. In your name. Sacred heart of Jesus thank you for life, i ask that you guide me through my ACCA F9 exams today lord Jesus. Bring force all my knowledge so that i may pass. Most Sacred Heart of Jesus thank you for all the blessings we have received and continue to receive. Sacred Heart of Jesus please help me and my husband and son achieve 6A2 in our business. Please help us be able to share and successfully help them join us in our endeavors. Please also continue to help me and my husband be faithful and love each other with you in our midst. Please also grant conversion to those in need of true faith and direction. All these we lift up to you Amen. Thank you Jesus for giving me confidence and l pray for it to continue. Bless my husband all my family and friends. In the name of the father. Amen. Please pray that God guides me when signing my lease renewal for my business. Please pray for my future as divorced lady. Please also pray for my relationship with my male friend. I am nit sure if God wants meg to continue our friendship. Sacred Heart of Jesus please bless me with the wisdom, endurance and strength that I will be able to pass my NCLEX examination on August 2018. By Your grace I know I’ll be able to make it and that will always be a reminder of Your love to me and my family. For in You, nothing is impossible. I lift up everything to You oh God. I claim victory in Your name. Amen. Sacred Heart of Jesus, strength for my son to break from his addictions and break free is his sinful ways. Build him up to have peace of mind and hope heart. Sacred Heart of Jesus, strength for my son to break from his addictions and break free is his sinful ways. Build him up to have peace of mind and hope heart. I pray to the sacred heart of Jesus, please hear my prayer. Please change me and my boys and my boyfriend. Change us Jesus. I pray for healing for me and my two boys. Heal our heart mind and soul. I pray for a husband, a home, and security. Please bring me a husband to love, honor, and cherish forever, and who will love, honor, and cherish me forever. I want to build a life with him. I pray for my boys and my boyfriend’s conversion to Christianity. I pray for our addictions and I pray for financial security. I need money to buy a house. Please guide me and my chosen husband to each other soon. Please take away my sister’s cancer and possibly mine,too. If it is not your will help us crepe closer to you. I plead for healing and reconciliation if it be your will. I unite all my pain and child’s pain to the cross. Help us to understand your will for our lives and family. Scared heart of Jesus, l pray that l may be delivered from poverty , late in progress,failure at the final moments ,and in our financial as a family, l pray that my husband be delivered from loving and find pleasures in the things of the world.l pray for my marriage, my sister’s issues of marriages, l pray for a proper job as of my age .let your will be done for l trust in you Jesus who will always find solutions to my problems, l also pray for all who l work with remove every evil on them against me.You are faithful God ,son and the holy spirit l rust in you. Dear Sacred heart of Jesus I pray for health and happiness in our sons family. Help them with love and courage to continue providing for their children. Bless and protect them at all time. I pray for my husband to find a way with his financial problem so he can retire blissfully. Help us to clear all our debts and regain somehow a place where we can call home. Bless our son Terry in his difficult relationship. May he find peace and love in his heart. I pray for guidance in our sons lives to be always on the right paths. Amen. There is so much heavy on my mind; I pray that my son M.D. pass his tests for a job he has applied for; I pray for healing for our relationship which is pretty rocky right now; I pray that my children M.D. and A.D. find their way back to the church; I pray for help with our finances, I’ve been out of work for over a year now with no luck of finding work in my field and we have run out of money; I pray we don’t lose our home. I pray for the my marriage, the health and well being of my husband P.D. and for health and happiness for my family and all of your family throughout the world. Dear Sacred Heart of Jesus, I believe in you, I trust in you; I ask forgiveness for all my sins and ask for your grace to do better in my life. My daigbter to be happy and loved. My son to keep him motivated stromg and nothing get in his way of joining the navy.fod bless he passes thr tests and. Physically be teady. I ask this in the name of jesus. Please keep LD an CD healthy and happy. Bring them back to the Catholic Church/Faith. Let their future children be happy, healthy, heathy, smart and beautiful. Dear Sacred Heart of Jesus, I pray for each of my children, grandchildren & great grandchildren. They need healing physically as well as mentally. Martin & Marlena, no longer need of drugs. Susann smoking & language. Sharyn, physical health. The grand children, who are all going thru emotional problems. Dear Sacred Heart of Jesus, I implore your help for a good job, that the hiring manager will consider me for the position which I am applying with a good salary and benefits. I also implore you Sacred Heart of Jesus for a home and financial breakthrough not only for myself but all who are in the same situation that I am and seeking deliverance. Sacred Heart of Jesus, please hear our prayers, please help us, please give us peace, please bless us. I pray in Jesus’s name, Amen, all for his Glory. Thank you lord for your son, Jesus! Amen. For the grace of a humble, patient, generous heart. Pray for emotional and physical healing. Am I suppose to have three separate intension or should it be the same intention throughout the entire Novena? Lord Jesus,Sacred heart of Jesus.on this feast of corpus Christi. I pray for money to finance my son throughout medical school I pray for money to pay my son’s tuition fees. Lord Jesus I pray for financial deliverance. I lift up to you my prayers and petition for our K1 visa. It’s been awhile since we’ve waited for any news and up to now there’s no update yet from the embassy. Heavenly father i offer it to you and place my trust in you, that it would be fast and smooth processing. And all these things will be according to your plans. In jesus name i pray!. Dear Sacred Heart, thank you for never letting me down. Please help me with job security. Help me find peace in being alone. Help me to have compassion for myself in the healing process. Help me see people for who they truly are. Help me have peace in my love life and help me find a stable partner. Someone that truly loves and cares about me.